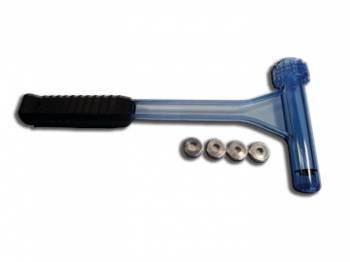 This Hammer-style, "Ultimate" Bullet Puller removes bullets quickly without damage to bullet or case. It pays for itself by saving your components. The rubberized grip is easy on your hands, The rubber insert in hammer tip is easy on your bullets. This Hammer Set comes with 4 collets. Universal, .22 center fire thru .45 caliber, (except .25 ACP). Easy to see when bullet has been extracted. Easy and convenient to use whether checking an occasional reload or pulling hundreds of bullets.